Renault boss Cyril Abiteboul has criticised the "increasingly frustrating and unacceptable" engine problems that have blighted their start to the new season. 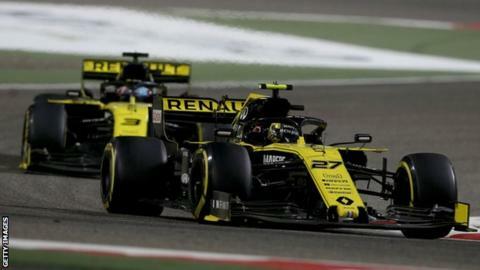 Drivers Nico Hulkenberg and Daniel Ricciardo retired at the same time with different issues three laps from the end of Sunday's race in Bahrain. "After a very intense winter, it has been a very bad start," Abiteboul said. He continued in a team statement: "Similar to [the first race in] Melbourne, our qualifying in Bahrain was massively compromised by minor electronics issues, which impacted both cars. "Our race came to a sudden stop so close to the finish. These are issues we have previously encountered but something we were unable to rectify in Bahrain." Abiteboul added: "We must react and shift our focus on to reliability." The recurring engine problems are masking Renault's pace, a clear picture of which has not yet emerged in qualifying at either race this season. Renault's engine has made a significant step forward on power over the winter and is closer to the standard-setting Mercedes and Ferrari engines than ever before. But of particular concern to Renault will be that Ricciardo retired with a failure of the MGU-K, the part of the hybrid system that recovers energy from the rear axle and through which all electrical energy is deployed to the rear wheels. This year, they have a new design, but it has suffered two failures in two races - McLaren's Carlos Sainz retired in Australia with an MGU-K failure in addition to Ricciardo's in Bahrain. Although the Australian qualified ahead in Bahrain, he had been off the German's pace all weekend until Hulkenberg suffered the engine problems that prevented him progressing beyond first qualifying. Ricciardo has now changed his schedule so he can take part in this week's official F1 test in Bahrain in an attempt to get on top of his struggles with the car. Ricciardo said: "There are for sure some things I need to figure out what I need in the car as far as set-up goes. It's not just it's got oversteer and understeer; it is the way the car rides and absorbs bumps and all these kinds of things. "I would love and in a way I expect from myself that I could just hop in and be on it and it's all easy and wicked, but to really maximise it it is a different beast and it is just taking me a bit of time. I got a lot closer but there is for sure a lot of room to keep improving. "It is in me in terms of driving style. I am carrying quite a bit of entry speed at the moment but killing everything on the exit. "Part of it could be over-driving with the current grip I've got and just bringing that back and understanding the best way to execute a good lap with this car. "I have been hearing how Nico talks and describes the car. I get it, but it is a different beast. "He is very comfortable. I made some comments about the way the car responded, saying I was a bit surprised and he said: 'That's just normal, that's the way the car is.' I'm just trying to learn from his experience with it. "It's getting there. I would love for it to happen like that but the positive is I know there is a lot for me to still gain from this car. I hope it happens sooner but it is going to be a bit of a process."